The integrated photonics facility is a 200m2 cleanroom designed for planar processing of a very wide range of materials not normally found in silicon processing facilities, from PTFE to germanium telluride, KY1-x-yGdxLuy(WO4)2 to Pyrex, and from ytterbium metal to lutetium biphthalocyanine. 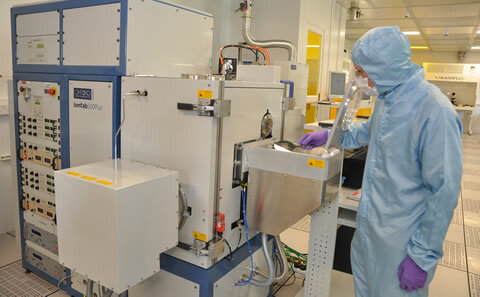 The prime purpose of this facility is to take raw and commercial materials, as well as those made by our researchers, and process them to realise photonic devices for use in applications from telecommunications to all-optical data processing and from biochemical sensing to the lab-on-a-chip. Thin film deposition, photolithography, etching and diffusion processes can all be applied to full wafers or unconventionally small or irregular samples. CMOS-compatible supercontinuum chips produced in highly nonlinear high-k dielectric films on silicon. A biosensor chip which can detect and identify up to 32 trace organic pollutants simultaneously in river water at ppt levels, such as oestrone at 1ppt and bisphenol-A at 20ppt. The world’s first Titanium: Sapphire laser on a chip. High-gain erbium-doped waveguide amplifiers for low-cost telecomms systems.